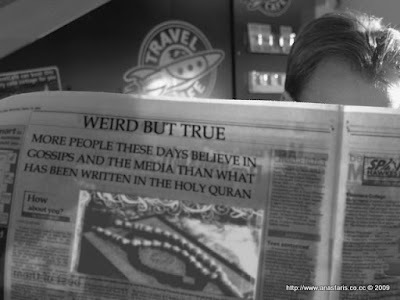 Weird but True - More people these days believe in gossips and the media than what has been written in the Holy Quran. The Quran is from the God, the truth that is undeniable. Yup it is undeniable fact! One of the reasons is most people take and read media as part of their life, while Quraan is being left away in their shelves. good comments from syafiq n affan!